I have been involved in motorsports racing since the 1970’s and most recently with Auto racing since 2010. I began racing and coaching in 2013 and have qualified for the year end SCCA National race 3 yrs in a row. I have won many North East Regional Road Racing Championships and was NEDIV Driver of the Year in 2014 and North East Conference Champion STU in 2017. 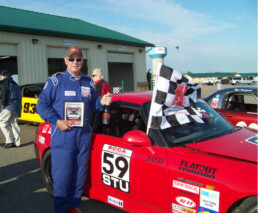 Qualified for the SCCA National Runoffs in Daytona. 1st place North Atlantic Road Racing Championship. Began tracking my Honda S2000 sports car. Began tracking with a 1996 Dodge Neon.